Tonight the Board passed another milestone in the years-long effort to update our district’s student assignment system — adopting updated assignment area boundaries for elementary schools and an interim citywide choice plan for middle school enrollment (feeder patterns to allow students to move from elementary schools to specific middle school placements will be put in place for 2012-13 enrollment). Boundaries are probably one of the most contentious parts of the effort, and I think the staff deserves some credit for managing this piece with a minimum (but not a total absence) of uproar. (Not so much on the middle school patterns. But you could argue, and some have, that the district listened to the very real objections raised by families and agreed to delay this part of the effort. So we may still get more uproar before the redesign is fully implemented.) Anyway, there was only the barest amount of public comment — one person thought we should introduce a “buffer zone” preference (after CTIP, preschool and attendance area) to people who live near an attendance area but not in it; then two members of the public showed up after we had already voted to urge us to delay middle school feeder patterns. No problem! 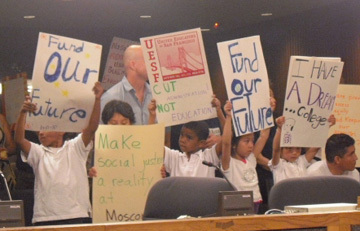 During public comment, staff and families from Moscone Elementary and Thurgood Marshall Academic High School came to protest cuts in their budgets resulting from lower-than-projected enrollment. Some of Thurgood’s concerns have apparently been addressed by the Bayview Superintendent’s Zone supervisor, Assistant Superintendent Patricia Gray. But the Moscone community is outraged over the loss of a $37,000 half-time Reading Recovery teacher and other funding — a total cut of $46,000. Moscone is a very high-achieving school despite its mostly low-income and English Learner population, and for the parents’ and teachers’ hard work to be rewarded by budget cuts (because of a seven-student drop in enrollment) is hard to swallow. And yeah, it was galling that even after hearing the Moscone pleas, five members of the Board voted for a $250,000 professional development contract ($125,000 of which will be paid out of precious unrestricted funds). I’ve written about NUA before and I am not going to belabor the point, but I do think it shows questionable priorities to continue to fund a pricey program with mixed reviews that was originally parceled out to schools in a very haphazard and non-strategic way, when at the same time you have successful schools coming to Board meetings begging to just keep the status quo. The Board also had its annual hearing on whether students are being supplied with sufficient textbooks and curriculum materials at all of our schools — last year we did pretty well but this year’s figures are terrible. There are a lot of schools that began the year without enough textbooks, and the Board asked for a full accounting of why this is (we have until the middle of next month to have adequate supplies and staff assured the Board we will make that deadline). Anyway, it appears that there are a lot of reasons for this year’s inadequate supplies. For one thing, high schools have more new classes due to the new A-G graduation requirements, and therefore had to order more new books; in some cases sites may not have put those orders in early enough or may have underestimated demand. Also, the state’s decision last summer to delay textbook adoptions to save money has had some unintendend consequences. Generally, textbooks are on a seven-year adoption cycle, so that texts are replaced before they become too old to be unusable. Textbook publishers plan for adoption cycles and stop printing books that are near the end of the cycle, which can lead to shortages for older texts. Since California has delayed adoption of some textbooks, districts are needing to replace old and damaged books and finding them in shorter supply than usual. Still, whatever the reasons — our students need books and it’s unacceptable for them to go without. The Superintendent has appointed a new manager to oversee the textbook inventory and ordering systems, and Board members will hear a post-mortem on this year’s systems breakdown sometime later this Fall. Finally: the Board passed a resolution in support of Prop. D, which would allow non-citizens with children attending San Francisco public schools to vote in school board elections. This entry was posted in BOE and tagged meetings, recap. Bookmark the permalink. Rachel, I’m hoping this isn’t meaning we’re intending to give the work to the previous contractor. There were too many off-the-cuff decisions by said contractor on how they implemented the algorithm that were undocumented and not communicated (e.g. it wasn’t until two years ago we found out that where you ranked a school was used as a tiebreaker in assignment). I’d be concerned if we used the previous contractor that the strategic simplicity they sought got lost in actual implementation. If we give the work to them rather than Stanford, they need to be given strong guidance on keeping to the spirit of the intended design. Moscone is a great school, but a big barrier to more Mission, Bernal, Portero parents taking it is the lack of afterschool care except means-tested care at its CDC. That’s a deal-killer for many working parents. If Moscone could partner with say Flynn or Buena Vista’s afterschool programs to do a pick-up/drop-off, then it would be a viable option for more working parents. Rachel: I want to express deep gratitude for your comments at the Board and on your blog regarding Moscone’s budget shortfall. As another staff member said ” She’s given us a ray of hope.” Parents and staff are committed to bringing funds back to the site ( this year..) so that our at-risk children get the support they need. Parents and Moscone staff have tried to pinpoint where these funds might come from. In addition to federal ED jobs dollars that are meant to “retain and rehire ” educators ( per a press release from California’s Superintendent of Schools Jack O’Connell’s), we are very curious about the district portion of the annual Prop A monies. 71% of Prop A goes to teachers for salary, bonuses and PD. Administration controls the other 29%- to be spent in several categories. The spending category that should allow for some flexibility is “Innovation, Research and Development”- receiving 2.6% of the district’s Prop A budget. Where did this money go last year? Where’s it going this year? Who’s the administrator in charge? I spoke to a few people in central office but no one seems to know. Thanks again for your support for our little Mission school that has been quietly “beating the odds” . @Anne C. online textbooks are definitely part of the future plan, and Board members were pretty much unanimous the other night saying that we want the district to investigate moving in this direction. But generally, I don’t think they’re quite ready for prime time, mainly because we can’t be sure we can purchase and maintain the equipment needed for every student to benefit. We can’t even get every teacher a laptop yet! That said, the Presidio test project is awesome. I’ve also been looking at demos of various online curricula — some are really promising. How do online textbooks factor in? I noticed my 8th grader does most of her science work online now, and leaves her science text in her locker at school. Science seems to be a particularly rich area for online textbooks, since there are a lot of video tie-ins. Obviously, not every student has online access. I saw the article about piloting iPads for math instruction at Presidio, which is really cool! @Frank – this situation involves confidential negotiations, so I’m not at liberty to say much at the moment. But yes, I understand why people are concerned and I am concerned as well. It’s a situation I’m keeping a close eye on — I do understand that there is a lack of trust that the district can pull this off in-house. I saw that Market Design, the group that helped design the new school assignment system, has been told that their services are not needed for the implementation of the new system. I’m surprised (to say the least) that the District has enough money to turn down this kind of expertise that has been offered for free. I can’t imagine that there are District employees who have the experience to implement and monitor this deployment. The EPC can’t post waitpool data on time, and there have been known problems with previous SAS software that weren’t uncovered until someone from the PPS read the source code. Especially the “top trading cycles” algorithm that is supposed to be implemented sounds like something best left to the experts, especially if that expertise is being donated. I read recently that the US has one of the highest spending per-pupil, but also has some of the lowest teacher salaries. This kind of decision exacerbates that. But it’s just money, right? Hi Jennifer – Commissioner Wynns and I voted against the resolution; the remaining five members of the Board supported it. I’d like to know who voted in favor of NUA, and wasn’t able to find to this info on the SFUSD BOA website – while all the agendas and notices there seem to be up to date, the minutes haven’t been updated since February… Is there another place to find board voting records on this issue, as well as others? I don’t have time to watch the webcasts. Thanks for all you do to keep the community informed. I hope you will continue to follow up with Moscone families and teachers on this ridiculous ‘budget adjustment,’ and the ways in which SFUSD perpetuates inequalities through current funding formulas. My daughter is in the third grade at Moscone, and my husband spoke last night as a special educator at the school. We both love it there, and think it’s just sad that we have to fight for ‘status quo,’ as you call it. I am absolutely sure there are funds that can be directed to support a successful school, and the school has consistently run on a tight budget, but we are asking the city not to penalize the school for a short term loss by cutting into our long term gains. We just hope that San Francisco Unified School District will show some commitment to a school that is working, that is serving English language learners and closing the achievement gap.